Call deflections are primarily a result of giving customers a way to quickly and easily solve their problem without interacting with a live agent. A 2016 article, How Call Deflection Can Enhance the Customer Experience, from website-visit-monitoring company SessionCam defines call deflection as “the science of re-routing a customer call to an alternative service channel” and notes that businesses should always focus on deflecting calls, not customers. Utilities can also deflect calls by improving the first-contact resolution rate, or how quickly a customer issue is resolved after they’ve first contacted the utility through either a call to the contact center or another self-service channel. The E Source Omnichannel Survey shows that customers often decide to call and speak with an agent after they’ve been unsuccessful using another channel, so making it quick and easy for customers to resolve issues via alternate channels can deflect calls. Call-routing strategies can also help improve first-contact resolution along with call deflection. Our report Creating Human Connections in the Call Center (available with certain E Source memberships) highlights the benefits of call-routing techniques that may reduce customer follow-up calls. For example, skills-based routing can produce efficiencies by connecting a customer to the agent best suited to handle their call. We’ve gathered five best practices for deflecting calls to self-service channels (Figure 1). At the top of our list of best practices for call deflection is ensuring that your self-service options are user-friendly. Though a customer may prefer to speak with a live agent, if they’re able to quickly and easily accomplish their transaction through another channel, they will still be satisfied with their service. Above all, customers want quick and easy resolution to their issues, no matter how it’s accomplished. Customers who use self-service channels are more satisfied with their utility than those who don’t, so getting more customers to adopt these channels can positively influence overall customer satisfaction. Self-service adoption in utility customer service has the dual benefit of improving the customer experience (CX) and decreasing costs. Most utilities are trying to figure out how to increase enrollment in online account management, paperless billing, email and text message alerts, and other programs that meet customers’ needs while decreasing contact-center volume. 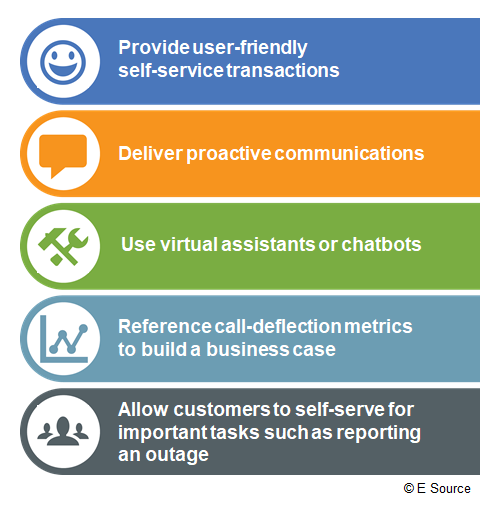 We’ve identified several tips for increasing self-service adoption. Using conversion-funnel analytics tools, utilities can isolate exactly where customers are having problems, investigate, implement a change, and then test the solution. You should ensure that each self-service transaction is functional. Conversion-funnel analytics is one of the more advanced methods to ensure self-service offerings are optimized. Using conversion-funnel analytics tools, utilities can isolate exactly where customers are having problems, investigate, implement a change, and then test the solution. Union Gas used conversion funnel analytics to discover that 76% of customers who initiated a transfer of service to a new address online abandoned the web page and called a live agent for assistance. After digging in further, the utility found that the online move-request form rejected incomplete address information, even if only one digit was missing from a postal code. Union Gas enhanced the form to accept partial addresses and used back-office agents to verify and correct those addresses. After this change, the utility noted that completion of online move requests increased and call volume for moves decreased. Use customer feedback. Ask customers what they’d prefer to do themselves and make sure they can do it. Start simple. Paying bills and reporting outages are often the easiest places for both utilities and their customers to start with self-service. Payment arrangements, which can be awkward for customers, are an excellent self-service candidate. Set goals to determine return on investment (ROI). For example, if a given self-service option deflects a percentage of calls from the contact center, utilities can calculate the avoided cost based on cost per call. Deflect calls to other, lower-cost channels. In addition to self-service, consider how you can deflect your most expensive contacts (usually calls) to less expensive channels such as chat. Use customer feedback again. Use transactional surveys from calls to ask customers how they tried to resolve their issue before calling. These surveys are opportunities to offer or improve self-service options. If a customer has an excellent experience in a given channel, that’s the channel they’ll return to. Use data. Analyze the top five call types, for example, and determine whether the interactive voice response system (IVR) and website can handle them. Play a hold message. Point callers on hold to the website, but acknowledge that this action will drive up abandonment rates. Remember that experiences affect future behaviors. If a customer has an excellent experience in a given channel, that’s the channel they’ll return to. If they try the website, get frustrated, and then get help from the call center, they’ll return to the call center. Use incentives. Union Gas waived the deposit requirement for new customers who signed up for online account access, paperless billing, budget billing, and other programs. Use data again. Software from data analytics company ClickFox and other tools will tell you what customers are trying to do at different stages of their journey, and show you where they’re giving up. Follow usability rules. If you make the online channel the best option available, then that’s what customers will start to use. Several utilities, including Entergy and Pepco, saw their call volume plunge after implementing proactive outage communications. Read more in our report Benefits of Improved Outage Communications (available with certain E Source memberships). In 2014, we learned from iFactor—a vendor that provides customer interaction management software—that outage notifications and maps delivered through a variety of channels can yield call-volume reductions in the range of 9% to 15% during outage events. Another solution that’s increasingly common outside the utility industry is the use of virtual assistants (VAs), or chatbots, to help customers navigate common inquiries. Using intelligent-system designer Nuance, Windstream Communications saw a 45% year-on-year reduction in live-chat volume. Following the implementation of a VA, Jetstar Airways saw a 10% increase in online bookings as opposed to the more expensive phone bookings. The Coca-Cola Co. found that 74% of all interactions with its VA eliminated the need for a call to the contact center. A 2014 report from research company Forrester, Good Alone, Better Together: Integrating Chat and Virtual Agents, describes how KLM Royal Dutch Airlines partnered with artificial intelligence firm Digital Genius for customer service automation. KLM reports that over 30% of cases are now resolved through the power of bot assistance. IBM asserts that up to 80% of common customer service inquiries can be handled by chatbots. Section 10.1 of the report How to Calculate the ROI of Online Communities from online community developer Feverbee describes how to quantify the reductions in customer service costs associated with direct and indirect call deflection. This article also equates inquiry deflection from channels such as email and chat, with call deflection because the focus is on self-service using online communities. The section describes three ways to measure call deflection—total staff costs, technology costs, and allocation of fixed overheads—and how to determine the monetary value of each call deflected. The report Close Enough: Simple Techniques for Estimating Call Deflection (PDF) from CX solutions company DB Kay & Associates also defines call deflection as avoiding any contact that requires human attention such as through chat, email, or online submissions. The report presents practical techniques for accurately estimating call deflection and for converting this deflection into a dollar amount. Focusing on customer needs will help align your efforts to reduce calls with self-service improvements that customers will appreciate. The article The Invisible Metric: Call Deflection from VA company Creative Virtual provides a few tips for companies that are looking to deflect more customer calls. It recommends evaluating what calls the contact center receives and what questions customers are looking for on the website. Focusing on customer needs from the beginning will help align your efforts to reduce calls with self-service improvements that customers will appreciate. According to data from the E Source Residential Customer Insights Center—an online analysis tool that compiles data from the Claritas Energy Behavior Track annual online survey of approximately 32,000 residential customers in the US (conducted in partnership with E Source)—customers who have conducted self-service transactions via a PC, laptop, mobile phone, or tablet in the past year experience higher customer satisfaction than those who have not. Moreover, those who have used self-service options for online bill viewing, outage reporting, energy-usage monitoring, and other activities are significantly happier with their utility than those who have not used these options. Many utilities are also starting to optimize self-service for moving interactions. Doing so gives customers more freedom and control.